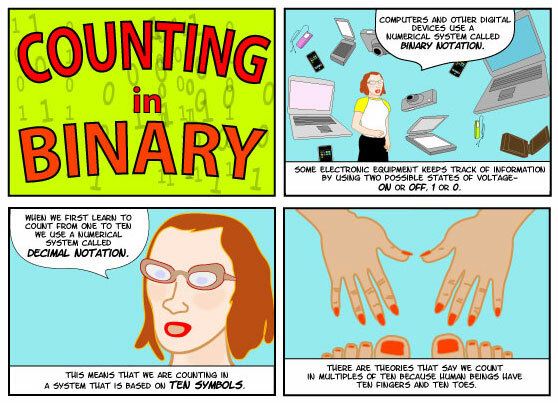 This is the first page of a comic I made for my students that explains how to count in binary notation. Chris Stein helped edit it and made a Flash application that tests ability to convert from decimal to binary and back. Man, I loved going through the binary comic. You made it rather easy to understand for a simpleton like me. It was fun “lurming”. I always wondered how it worked. I kind of knew something about it (not really, just that 1=+ and 0=-), but I was completely unaware about the method of counting by using it. Would it be ok if I shared it on my Facebook? If so, I would of course give credit to this website. Cheers! Sure, share it. Glad you liked it. PreviousPrevious post: Dolls of the Cons on Comics Beat!